Honey Bee or something else? From May through to September we receive a lot of calls for bees many of which are bumble bees, it used to be that most of these bumble bee calls were for bee nests in compost heaps, beneath wooden decking and other similar locations. These days the majority of bumble bee calls are for a recent visitor from Europe, the Tree Bumblebee, these are often found nesting in bird boxes, wall cavities and mostly roof spaces and on occasion in tumble driers. Bumble bees come in a mixture of sizes but are best described as the larger furry bees that don’t look as if they should be able to fly. Most species of bumble bees are best left alone where possible as the nest will die back before winter. However in the case of the Tree Bumble Bee we advise relocation of the nest where possible, especially if they are over looking an area of activity; please see out Tree Bumble Bee page for further information. Rarely would we advise the killing of a native bumble bee nest, but when necessary we will advise the use of insecticide on a Tree Bumblebee nest if we are unable to reach it to relocate it. Otherwise we are called about large numbers of bees, thousands of them whirling about in the air before they settle and cluster around a specific feature, these are honey bee swarms. If you see a swarm of bees hanging on a tree or bush they are there waiting for scout bees to report back with news of a permanent home, and will often leave in a few hours or days. They are unlikely to be aggressive if left undisturbed. The British Bee Keeping Association and the Welsh Bee Keeping Association keep a list of members who should be appropriately equipped with both knowledge and suitable equipment to collect these swarms. 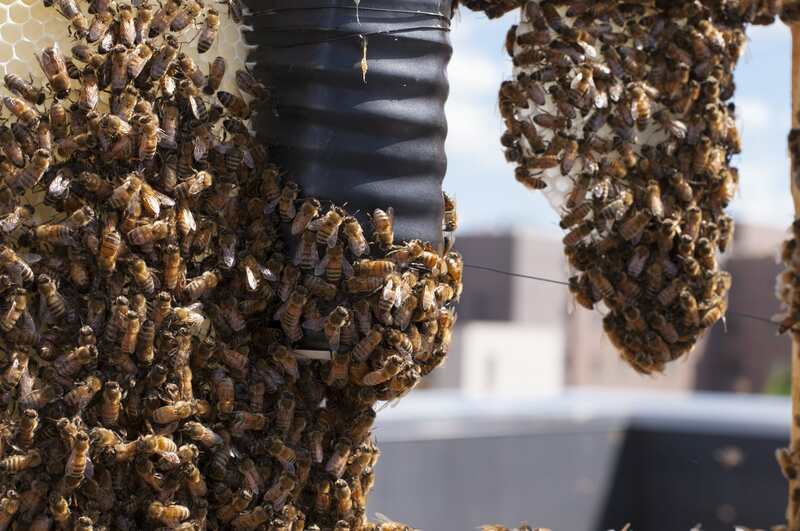 If however the honey bees are clustered up around some feature of your property and the number of bees appears to be reducing without you seeing them flying off then you need to act as quickly as possible, giving somebody like us a call. 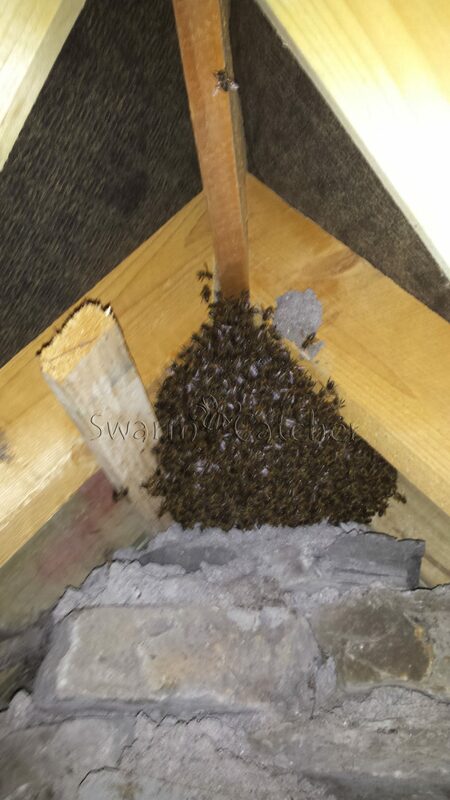 The quicker you contact us the better, because the longer a swarm is in your property the harder it is to get it out, and consequently the more expensive it is to get it out. 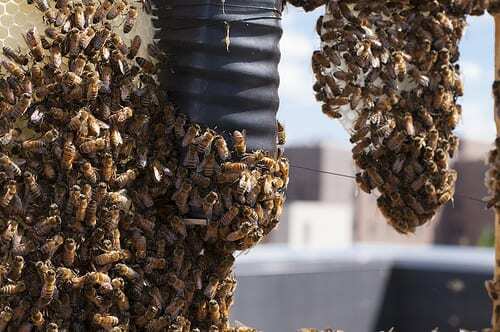 A swarm is a good thing, it’s a sign of a healthy and growing hive. Swarms usually occur between May and August. Swarms are a normal part of a honey bee colonies life, it is a process that is planned and organised by the bees ahead of time. Because it’s an organised event the bees are very calm; they have a plan, and they know what they’re doing.They’re not angry or upset. Instead they are congregating and searching for a new home. Generally the honey bees swarm when their current home is too full. The hive decides it’s time to divide. Half stay behind in the current home and have themselves a new queen. The other half and the old queen leave to find a new home. A swarm is how honey bees reproduce, they are house hunting, they have no wish or interest in stinging or hurting anyone! The old queen will leave the hive, taking about half the bees with her. She’ll fly to a spot not too far away and the bees will gather around her, forming a cluster. Often they will hang from a tree branch. Before the bees swarm they eat as much honey as they can which they store in their honey stomach. While the swarm waits, they send out hundreds of scouts. These scouts are tasked with finding a new home. They’ll search within a five mile radius, for a suitable home. The scout will carefully examine a potential home. Once satisfied she’s found a good spot, she’ll return to the waiting swarm. Then she dances. The dance tells the bees where the location is. The better the location, the better the dance she’ll do to convince them. Soon other scouts will go to check it out. Then they’ll return and dance convincingly too. The bees will decide which location to go to based on the best dances of the scouts. Before long, they’ll decide to move to the new home. That’s when the scouts will make piping sounds. The piping tells all the bees, get ready and warm up your flight muscles because we’re leaving soon. When everyone is warmed up and ready to go the scout will do Buzz Runs. Once at their new home, the workers will get to work immediately secreting wax so they can create honeycombs. Then they’ll regurgitate the honey they brought with them into the freshly made comb. That way they will have food on hand. Back in the old hive, the remaining bees will create a new queen who will then take over the running of that hive. Dr. Thomas Seeley has created 10 short videos of a swarm in progress which show the various stages of a swarm and explains these stages (we did have a link for these great videos but can’t find one currently, as soon as we do we will post it). In the meantime he has another interesting video (more than an hour long) that is worth looking up about swarm behaviour (search for Tom Seeley “Honeybee Democracy). If you have a bee swarm or bee colony contact a bee keeper – we are both bee keepers and pest controllers. Call someone that cares, not just an exterminator that will kill the bees and charge you for it and most likely not do it in accordance with best practice or advise you on the additional problems associated with using an insecticide on a colony or swarm. For situations in which a beekeeper can’t help, call us – we specialise in these situations. For easy bee swarms in Cardiff and surrounding area give us a call on 02922 401 649 and we will relocate them for you. 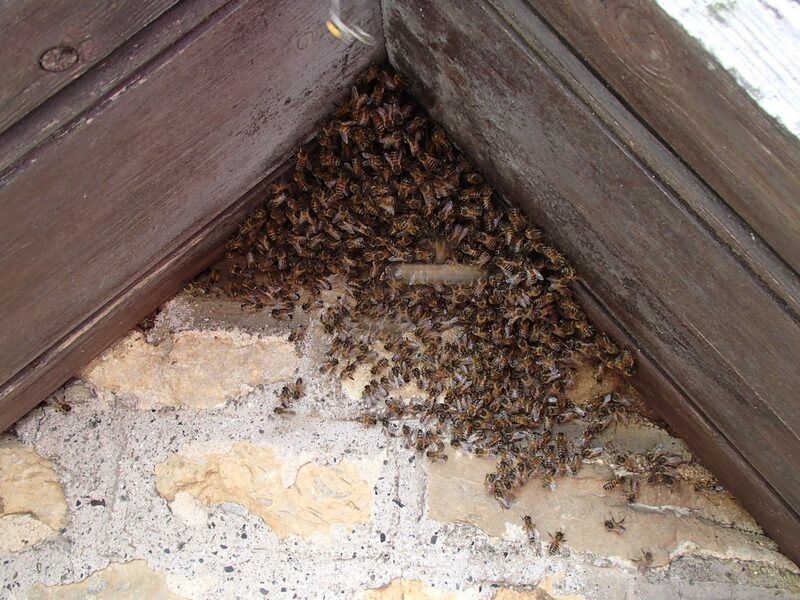 For easy bee swarms in and around Lyme Regis give us a call on 01297 441337 and we will relocate them for you. We cover Devon, Dorset, North Cornwall, Somerset and South East Wales for the live removal of honey bees from chimneys, wall cavities, roof spaces and any where else they may get to. For Live Bee Removal in S. West and S. Wales call the Swarm Catcher.